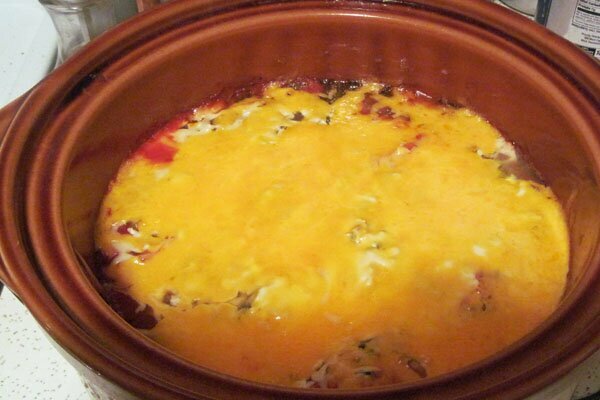 In the crockpot, layer the bottom with about 8 corn tortillas. Pour a bottle of green taco sauce on the tortillas. Add 1/2 large can of white chicken, broken apart in smaller pieces. Add 1/2 can of black olives. Add 1/4 cup chopped onion. Sprinkle with a cup of cheese. Next, add another layer of tortillas, a bottle of green taco sauce, 1/2 can of chicken, 1/2 can of black olives, 1/4 cup chopped onion. Finish by sprinkling a cup of cheese on top. Cook on low 4 hours or on high for 2 hours, until the cheese is melted. Serve with tortilla chips and spread shredded lettuce and tomatoes on top, if desired. My family loves this recipe. I try to find family-friendly recipes my kids enjoy because I believe that family dinners are very important. Vitally important, in fact, to create family unity. A society is only as strong as its families. Today, in our fast-paced, technologically-saturated lives, we seem to spend more time in front of a computer screen, Smartphone, or TV instead of building relationships with our families. Our lives are filled with activities and many of us find ourselves rushing from one activity or event to the next with barely a thought for dinner. We may pick up fast food on the way to a game or between kids’ ballet classes. We may come home, exhausted from running so fast, and let everyone find his or her own food for dinner, thus missing an opportunity to spend time with the most important people in our lives. When asked what helped him best prepare to leave home and begin his adult life, my oldest son answered that having family dinners together had had a great influence on him and his choices. I had never realized how important that time can be to develop and maintain family relationships and establish family unity. The most important relationships we’ll establish in our lives will be within our families. Dinner is a perfect time to ask questions, tell funny stories, and relate the day’s happenings. I have learned with my family of ten children, that kids want time with parents and siblings. Lots of time. We often hear, a family who prays together, stays together, but I’d like to suggest that in addition to that, a family that eats together, and more often meets together to build relationships, stays together. Family unity doesn’t happen on its own, it takes time and effort, but the time we invest in our families today, will pay off in dividends for years to come. When we invest time in our families, we create strong bonds that last. Family dinners are one of the best ways to invest in our families and create those long-lasting bonds. This looks so yummy!! Might have to give this a try. Thank you so much for featuring my post and recipe. I appreciate it.